For any new players to Where on (Google) Earth, simply put the lat-long or detailed description of the location in the comments below. A lot of us will typically say a little something about the geography or geology and sometimes we share our tactics for searching. If you win, you get to host the next one. The Schott Rule (previous winners must wait for 1 hour for every win) is in effect. Beautiful - but I don't have a clue. Back to GoogleEarth! 25°52'S, 113°54'E. Faure Island ,WA, Australia. I don't know anything about the geology of the area but it must be somewhere arid and in the tropics. Plus, the "U" shaped structure in the water just to the left of the word "image" suggests that the predominant flow of water is to the NW. I had been looking around the Arabian peninsula until I noticed that so I went over and had a look at the W and N coast of Australia and found it. I don't know anything about the geology here. It looks like an arid area in the tropics. The clue was the "U" shaped structured in the water near to the word "image" which suggested that the water was flowing NW. I had thought it was somewhere around the Arabian Peninsula until I saw that and had a look at W and N Australia instead. Apologies if this is a triple post. I can't tell if my previous two posts made it. 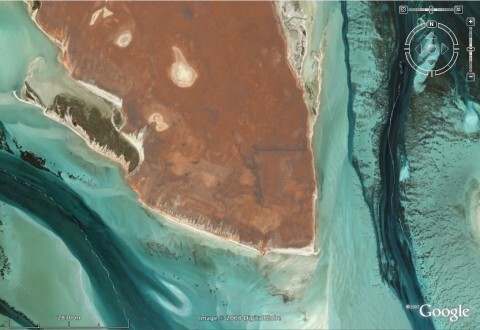 Shark's Bay, Australia ... famous for it's modern stromatolites. @Thin Section: Your posts were kept in the moderation queue and I got up from bed only now to set them free. Perhaps I should look into multilingual WordPress, so English-speaking people could find out why their comments didn't show up. So, no offence taken regarding triple posting. Thin Section was first, and if I'm not mistaken, also not too early (for Schott's rule). So we're looking forward to see WoGE #96 on Thin Section's site. #96 if up now At A Thin Section.